Detroit Free Press technology columnist Mike Wendland writes, "I'm back from a 281-mile bicycle ride called the Michigander and about the only thing that worked perfectly was my Apple PowerBook G4 12-inch laptop." Syscan's TravelScan 464M is a bus-powered, USB portable page-fed scanner with 600 x 1200 dpi optical resolution that accepts pages up to 8.5" x 14". It includes Abbyy FineReader/Sprint OCR software for Mac OS X plus a TWAIN driver. The TravelScan 464M is $179 for Mac OS X 10.2 and Windows. Digital-imaging technology took a significant leap forward with the introduction of model 464. The newest member of TravelScan family and the industry's first 600 dpi high resolution truly portable A4 color scanner that interfaces to any standard USB port. The 600 dpi resolution provides the high quality of output for photo scanning and the better OCR quality. The TravelScan464 is a lightweight (390g) mobile scanner that requires no external power adapter. Its USB port connection feature allows for a fast and easy one-cable hook up to your notebook or desktop PC and the unique "launch" button starts your imaging application instantly. USB interface, 600 DPI, automatic application "Launch" button. Internal 48-bit analog-to-digital conversion for RGB three-color channels. Keyspan is shipping retractable charging cables for most popular cell phones. The cables allow a cell phone to be charged from the USB port of a PC or Macintosh and are designed for use with Nokia, Motorola, Ericcson, Siemens, Sony, Samsung, LG Mobile, Sanyo, and Kyocera cell phones. Keyspan has also released AC and DC adapters that allow cell phones to be charged from a power outlet in a building, car, or boat. "Almost every laptop user carries a cell phone when traveling," notes Mike Ridenhour, president of Keyspan. "Charging the cell phone from the USB port of the laptop makes it possible to leave bulky cell phone chargers at home. Keyspan's ZIP-LINQ retractable cables are easy to carry and convenient to use." Keyspan's ZIP-LINQ cables are available to resellers via Ingram Micro and to consumers through leading catalogs and online resellers. Pricing for the retractable cell phone charging cables ranges from $21.99 to $29.99. The cables feature a remarkably compact form factor. The cable spool is about the size of a quarter - yet the cable extends to 30" by pulling on both ends. Simply pull again and the cable retracts back into its small yet durable housing. The ZIP-LINQ line of cables is a result of Keyspan's partnership with Cables Unlimited, a Concord, California-based manufacturer and distributor of cables. Keyspan and Cables Unlimited are collaborating to market ZIP-LINQ cables in the United States. Keyspan is the #1 USB Connectivity vendor in the United States as ranked by NPD Intellect in 2000, 2001 and 2002. You can read my review of Keyspan ZIP-LINQ retractable cables on MacOpinion. D-Link has announced its multiport hub that delivers a combination of media-friendly USB 2.0 and FireWire ports in one compact device, the D-Link DFB-H7 QuickMedia USB 2.0/FireWire 7-port Combo Hub. Featuring the two popular connection standards for digital media and peripheral devices, the D-Link DFB-H7 can simultaneously connect four USB 2.0 and three IEEE 1394 FireWire devices, such as DVD drives, digital cameras, and printers to the PC or laptop for transferring, editing, and printing digital content. The D-Link QuickMedia USB 2.0/FireWire 7-port Combo Hub provides high-speed connectivity through the power of USB 2.0 and FireWire. The USB 2.0 ports can transfer data at up to 480 Mbps, 40 times faster than USB 1.1 hubs, and are backward compatible with USB 1.0 and USB 1.1. The D-Link DFB-H7's three FireWire ports support transfer rates of up to 400 Mbps. At these speeds, users can edit home video, transfer music, and print digital images without latency. Because the hub is externally powered, the D-Link DFB-H7 can support multiple devices via daisy chaining through the hub. It also supports over-current detection for any device that is plugged into the hub. The combo hub is a true plug-and-play device, requiring no device drivers to install, and supports both PC and Macintosh-based operating systems, including Mac OS X (10.2) Jaguar. Both a FireWire cable and a six foot USB 2.0 cable are included in the hub's packaging. The D-Link DFB-H7 USB 2.0 and FireWire Combo Hub will be available in early August through authorized retail, reseller, and distribution partners at a manufacturer's suggested price of $49.99. The D-Link DFB-H7 Combo Hub comes with a One Year Warranty and absolutely free 24/7 technical support. 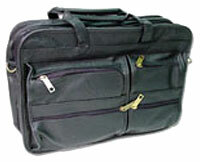 Do you have occasion to travel with an arsenal of laptops? Willow Design has just announced a set of cases to fit multiple titanium PowerBooks, 14" iBooks, and clamshell iBooks, to make setting up portable Macintosh curriculum labs easier. 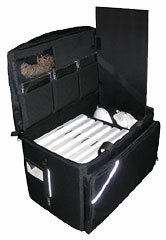 The cases were designed as a result of customer requests after Willow released its popular 12" iBook MacLab case in December 2002. The Mac Lab cases offers a compact, convenient, and very protective solution to carrying up to seven Mac portables plus an AirPort hub, the power supplies, cables, and some other accessories needed to operate a Macintosh lab, all in separated and highly protective compartments. The 14" iBook MacLab case also fits the Pismo or Lombard PowerBook G3. After creating the 12" iBook Mac Lab case, Willow was particularly surprised by the number of requests for clamshell iBook versions. Willow president, Nigel Peck, was heartened by the number of school boards that were still using these hefty laptops, even though they have been long discontinued. "It's a sign of the quality of the Mac, that they continue to work so well - I'm sure all PCs would be long gone!" commented Peck. 1.2 cm (0.5") foam reinforced by corrugated plastic on five sides with 4 mm (1/8") hardboard on the bottom. The fabrics give an excellent balance between superb protection and durability and light weight. internal protection provided by separated corrugated plastic dividers for all the iBooks, the AirPort, power supplies, etc. Convenient elastic CD-ROM pockets for your operating system CD-ROMs. Elastic band pocket for conveniently securing power supply cords to avoid a tangled mess. Horizontal top divider and storage space for manuals or other items. Convenient front organizer pocket for pens, pencils, calculator, etc., plus room for legal sized paperwork. 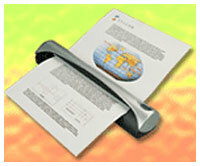 External business card pocket to identify the case or set it up for shipping. Reflective strips on the front and sides of the case for nighttime carrying safety. Quick release buckled web strap to easily strap the case to roller carts for easier transportation. Luggage feet riveted through the hardboard bottom of the case which actually keep it up and off the ground when you want to set the display down whilst entering and leaving your vehicle. secure wrap handle straps with padded hand grip. contoured, thickly padded shoulder strap with heavy duty snaphooks for secure carrying. MCE Technologies, LLC is shipping new 12" and 14" 900 MHz iBooks with an internal DVD-R/RW drive as standard equipment instead of Apple's CD-RW/DVD Combo drive. Each iBook with the internal MCE DVD-R/RW drive is compatible with Apple's iTunes and disc burner software, and includes DVD authoring software for both Mac OS X and OS 9 that enables the creation of video DVDs directly from the iBook which are playable on most computer and home DVD players. The easy to use software allows for customizable menus, backgrounds, music, etc. in the creation of video DVDs. The 900 MHz Apple iBook with internal MCE DVD-R/RW drive also ships with Roxio's Toast Lite software to facilitate faster and more efficient data DVD and CD recording. "For the same price, users can now buy an Apple iBook which can not only burn typical 700 MB data and audio CDs, but is now capable of creating real video DVDs, playable on most computer and home DVD players, as well as 4.7 GB data DVDs for reliably backing up large amounts of data at a time," stated Arnie Ramirez, president of MCE. The 900 MHz iBook with internal MCE DVD-R/RW drive writes to standard 4.7 GB DVD-R and DVD-RW media at 1x speed, reads DVD-RAM media, writes to standard 650 MB (74 minute) and 700 MB (80 minute) CD-R media at up to 16x speed, writes to standard CD-RW media at up to 10x speed, reads DVD-ROM discs at up to 8x speed, and reads standard CD-ROM discs at up to 24x speed. The 12" 900 MHz iBook with internal DVD-R/RW drive maintains the original retail price of $1,299 and the 14" iBook, similarly equipped, also maintains a retail price of $1,499. Both are available for immediate shipping. Other customizable options such as a larger hard drive or increased memory are also available. Carry your belongings in style with this black faux-leather portfolio! With seven pockets and multiple subpockets of various sizes, plus an expanding midsection, there is plenty of room for whatever you need to carry! All the style and sophistication of leather without the cost! PlasmaDesign has expanded its widescreen desktop wallpaper collections suitable for use on Apple Cinema Displays and PowerBooks, with the release of four new dual monitor wallpapers. All of these images are rendered at a resolution of 3200 x 1200 pixels and are suitable for twin screen setups comprising of monitors with up to a resolution of 1600 x 1200 each. PlasmaDesign is committed to adding one new dual screen wallpaper a week to the galleries. The dual monitor wallpapers are only available to PlasmaDesign members.